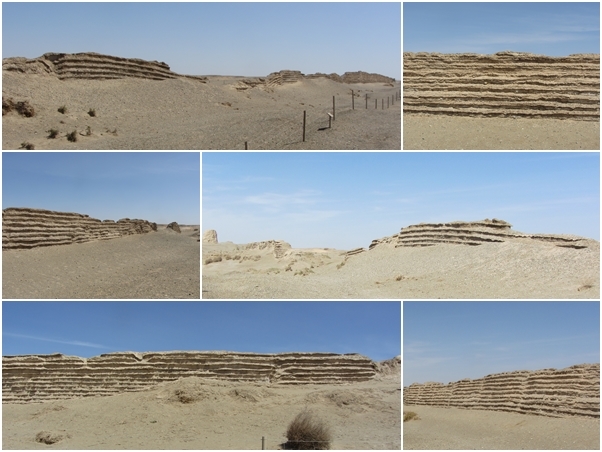 The western end of the Great Wall of China is generally accepted to be Jiayuguan – but in 120 BC several hundred kilometres further west another long segment of wall was built. Being so far out it wasn’t used for long, and therefore not renovated over time. The remnants of wall still visible out there are truly over 2,000 years old. Yumen Scenic Area was my favourite attraction of all we saw in and around Dunhuang. 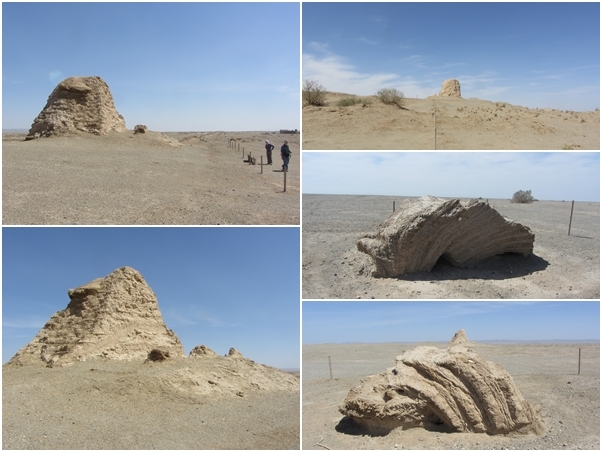 It is in the desert about 90km (55mi) northwest of Dunhuang, and has three main sites to visit, plus the road out to the Yadan landforms (but that’s so far away we chose not to visit). It was a frontier area, with the wall built (and soldiers stationed) there to protect the local people from marauding nomads known as the Xiongnu (this people group may have been Huns, but historians aren’t sure). Now it is eerily deserted. The first thing we looked at was the furthest away from the entrance – well preserved sections of the Han Great Wall (汉长城遗址 hàn cháng chéng yí zhǐ). In this area there was little wood and less stone, so the wall was mostly a mud/straw construction. Rammed earth, layers of straw-like local plants, mud bricks – these were the materials used. Originally the entire wall would have been covered with a layer of mud, or mud bricks. 2,000 years of exposure to the elements has eroded this layer from even the most intact sections of wall. 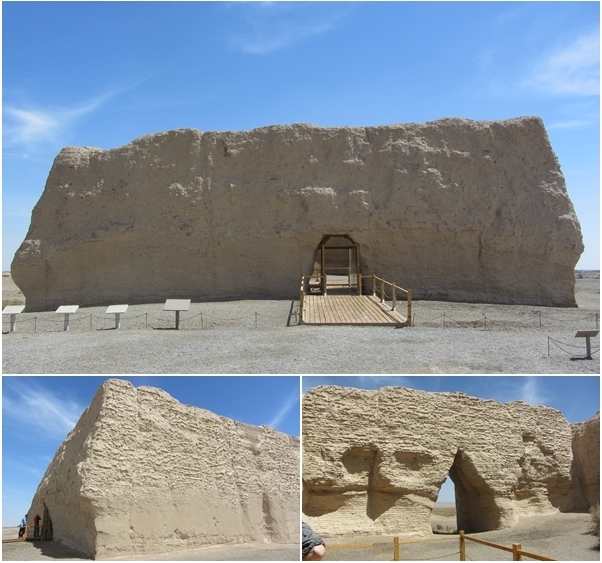 This means that we could see the construction of the wall – the layers of straw. The straw was arranged in alternating layers – in each layer the straw was laid perpendicular to the layers above and below, for added strength. It was fascinating – and surprisingly tall! The most intact sections were about 3m high. We walked along the wall (next to the guard fence, anyway) to the remains of a signal tower. Again, it has eroded greatly, but a lot of mudbricks are still visible. Despite it’s weathered state it is still an impressive structure, about 8m high. (My friends are in the corner of one of my photos below, to give you an idea of scale.) Originally the wall had signal towers every few kilometres all the way along, so that messages could be passed from one part of the wall to others, by fire or smoke. A daily chore for soldiers stationed along the wall was to cut and prepare the straw-like local plants. The plants had to be dried, and made into ready-to-burn bundles – and laid out in layers perpendicular to one another, like in construction of the wall itself. They were actually coated to make them easy to store and easy to burn – which also meant that piles of prepared straw-reeds left behind became essentially petrifed. They’re still there after 2,000 years, sitting under the desert sun in static toppled piles. 5km back down the road we came to the second site: Yu Men Guan 玉门关, which means “Jade Gate Pass” – a name that apparently relates to the jade that was imported into ancient China from Xinjiang through the pass there. It has been restored slightly, but not extensively like the restored wall sections near Beijing. It is a big sqaure, each side about 20m long, and about 10m high. There are two doors through the thick walls of the square building, and inside a ramp for horses to get onto and down from the walltop. Looking closely we could again see the alternating perpendicular layers of straw used in the construction. Another 10km away is the third site – the remains of a huge ancient granary, Da Fang Pan 大方盘, at a place called He Cang Cheng 河仓城, near a river. Originally there was the huge granary itself, plus a full wall around it, and guardtowers on each corner. This may seem strange, but the granary was effectively the army’s treasury – because soldiers were paid in grain. It was most likely a centre of activity when the wall was in use, with a market for the thousands of soldiers to buy things with their grain-pay. I was absolutely astounded by how much of the granary remains after centuries of erosion. There are windows, doors, even the remains of an internal wall. It’s a huge building, and the closer we got to it the bigger it loomed above us. The structure is about 130m by 20m (400ft by 60ft), with walls near 8m (25ft) high above a thick rock foundation. On a hill above the granary is another signal fire, but we chose not to climb the hill to see it. All around were weathered rock formations remiscent of the natural formations at Yadan National Park further west. The layers of the rock reminded us of the layers in the construction of the wall, and had us wondered where the wall ruins ran. Once we knew what to look for we could pick out the tiny weathered wall remnants quite often. (If you’re interested in more stories and photos, here are two great blog posts, one in English and one in Chinese). Next we drove 80km (50mi) south to Yangguan. The main attraction there is a reproduction of an old military post – complete with command tent and war machines. There is a museum with lots of relics unearthed in the area, too – weapons, mill stones, containers… all sorts of things. The Chinese labelling stretched my translation skills but it was fascinating none the less. The one ancient relic is an old signal tower on the hill above. We chose the electric cart to drive us up the hill rather than the horse-drawn cart, then spent most of our time at the top not looking at the signal tower but instead drinking in the breathtaking view of the layered mountains to the south – the Min Sha Shan megadunes, the rocky San Wei mountains and the snow-capped Qilian mountains.